This entry was posted on Saturday, October 1st, 2011 at 13:54 and is filed under Barack Obama, Election 2012, News, Politics, Tea Party. I try to steer well clear of conspiracy theories on this site, but occasionally, circumstances and events will lead you to seriously consider some of them. This week, we had at least two instances of powerful Democrats calling for a diminution of our Republic by extra-constitutional means. As I covered them, there was the case of Peter Orszag decrying the slow and ponderous process of democracy, and the other was the case of North Carolina governor Beverly Perdue allegedly joking that we should suspend congressional elections for two years to let the members work for a while without immediate consequences from voters. Most people who have reviewed the audio question whether Perdue was joking, but on Friday, this story gained a good deal more traction when Rush Limbaugh brought it to the world’s attention with a story in the CanadaFreePress: Warning: The Threat of Suspended Elections is Real. While this entire episode is somewhat disconcerting, we are easily heartened by remembering that such an action has never been undertaken even under the worst circumstances of our Civil War. If ever there had been a President with the plausible excuse to try such a maneuver, it had been Abraham Lincoln, yet while the war raged, he did no such thing. For a US President to even begin contemplating such an unprecedented idea would suggest a level of treachery and treasonous intent well beyond anything we have ever seen in the US. The very idea of suspended elections is anathema to our core principles, when we remember them, and the fact of our sparse historical educations may leave us open to those who would actually consider such things. This brings us to the question of Barack Obama’s temperament and his suitability for the office to which he has been elected. What McLeod offers here is what many of Perdue’s critics have asserted: That the line about suspending elections wasn’t a joke or sarcasm as she’s since claimed, but instead a sort of trial balloon on behalf of the Obama administration. That sort of tactic is not unknown in Washington circles, and to be honest, it might not be only the Democrat establishment that is willing now to contemplate such a tactic. There are many Washington-insider GOP establishment types who would really prefer to avoid a re-election in the coming year if they could because the grass roots conservatives and Tea Party folks are offering challenges across the board. In fact, some now think the move of the Florida primary to an earlier date is a play in the direction of closing off Tea Party-friendly candidates, and to an extent, they may well have a point. While in certain respects, it could play a lesser role at the presidential nomination level, this effectively kills off many of the primary challenges that might otherwise have been offered at the Congressional level. In effect, this whole effort to move up the primary schedule by Republicans may be the play of the establishment in defense against a conservative and Tea Party insurgency, not merely to the White House, but to the rest of the ballot. It’s quite clear that Obama is unlike previous presidents inasmuch as he is willing to undertake actions that his predecessors would not, for instance, willfully ignoring laws enacted by Congress in refusing to enforce them, in matters of immigration, and frankly on any other matter that suits his administration. We are learning from “Operation Fast and Furious” that there exists a cadre of people within his administration who are willing to sacrifice Americans and Mexicans to create an excuse for the restricting of gun sales, so what would lead anybody to suggest this administration would not go further still in maintaining power? He may even have willing accomplices in the establishment of the GOP, still smarting from their own losses to the Tea Party, and with all this in mind, one can only imagine what sort of “bipartisan concessions” Congress might be willing to accept in the face of some ginned up or real emergency. As I have said from the beginning, I tend to avoid conspiracy theories, but the problem is that in this case, there’s too much evidence to suggest that the potentiality is there, because the panic is there, so that the intent may be there also. 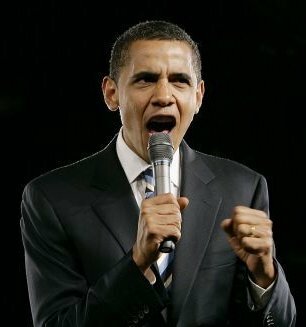 Obama has a well-documented presidential record of driving our economy off a cliff, flouting the law, instigating unrest, and instituting extra-constitutional policies without reference to the rule of law. In short, he’s already taken on the appearance and behaviors of a dictator in many key ways, and it’s really not a giant leap to imagine that he could push the envelope a good deal further in the name of maintaining his power. He’s desperate, and he’s building his army who will be happy to support such an operation. Whether he will actually attempt something of the sort is perhaps a matter of controversy, but he’s clearly demonstrated the audacity and capacity for worse. 18 Responses to Revolution by Suspended Elections? Lets get together for the better of America!!! No compromise! This is war. One side will win and the other either join the winners or lose. Could this possibly come about without the support of the military? In my mind, those in the military are more supportive of the Constitution, and all it holds dear, than any other group in this country. Do you (we) really think they would allow for the suspension of Constitutional elections? I'm sorry, but have you been asleep for the past year or so?……The very upper brass of our military is hopelessly corrupt and fully on board with the current communist takeover of our government. Don't believe me??? — Just ask Terry Lakin about it. I was not referring to the "very upper brass" at all. I've been saying that this has been the plan for the past three years. This administration has/had no intention of having future elections. Paraphrasing Obama from 2009, when questioned if his policies wouldn't cost him re-election, he said, if things go as planned, it wouldn't matter. I don't know if this group of sixties communists will be able to pull of this coup. They've stacked most of the important agencies with their people, It may come down to the military, as congress seems to have lost their fortitude. When Abraham Lincoln suspended the right of habeas corpus during the Ameican Civil War, and nearly incarcerated Roger Taney, the U.S. Supreme Court Chief Justice, for disagreeing with, and ruling against, him, all of the Northern military troops, and brass, were supporting him. Lincoln did many things dictatorially that were against the U.S. Constitution, and he dd them with impunity, even though another Supreme Court declared what he did as unconstitutional, after the fact. 9/11 didn't make sense according to the official federal government version of the WTC and Pentgon attacks. It defied the laws of physics, and common sense. It was full of lies. It, nonetheless, was consumated and declared the official explanation by the entire federal government and military. If Obama and his cronies can, with impunity, refuse to enforce valid laws passed by Congress and signed by former Presidents, if he can get away with usurping the office of U.S. President by getting elected without being constitutionally eligible, he wil probably think he can suspend elections with impunity. If he attempts to do so, it will be the American Revolution al over again. You're quite right in a number of respects about Lincoln. I entirely disagree with you on the physics of the 9/11 attacks. "Common sense" can sometimes be deceiving, as for instance in quantum mechanics, the Heisenberg uncertainty principle, where we find that counter-intuitively, we can know either the precise location or the precise momentum of a particle, but never both simultaneously. We should always take care to discern between imagined relationships, and those that are real, particularly in cause and effect. As for Obama, yes, he has ignored the Constitution in many respects. Please. The same rumors flew around when Bush was in office. Hype. And you'd love nothing more than an excuse to take the fight from the blogs to the streets. Don't worry, I agree. I'd give anything for the chance to take off the gloves and smash some right-wing proto-fascists. Mark, unfortunately, I don't think your concerns are that unfounded. Here's one way I see Obama playing out this end-game (and I think the winks and nods to the Occupy groups were the walkthrough for 2012) – foment so much civil unrest and riots in 2012 that he will declare a national emergency and "delay" the elections. And the mainstream media will support it. He'll start talking regularly soon about how there "probably are a lot of people who may resent that a black man is president" – that kind of comment, and when there are full blown riots (started by his SEIU, Black Panther, and he and Michelle's old SDS and other radical buddies, i.e. Frances Piven), the media will carry his message. "Why if there are riots in Chicago, and NY, and LA on Election Day, how can people get to the polls? You have to delay them, just for awhile of course, until things can calm down some. If you still think the elections should be held in the midst of these riots, then you are clearly a racist Republican, knowingly depriving blacks (who are most affected by the riots) of their right to vote – just like you did in the South….". It's going to take a lot of courageous people to stand up to Obama and the forces he's about to unleash on this country over the next year +. The House of Representatives shall chuse their Speaker and other officers, and shall have the SOLE POWER of IMPEACHMENT. SO what have they been waiting so long for? Maybe some representative would answe this for ALL of us. Again O has been legislating by executive order, circumventing Congress, Senate and the Constitution. Selectively not enforcing the Voted and Established Law of the Land is at once the minimum of Call to Order by Congress and Senate deeming ignoring the law is unconstitutional and even orders for impeachment. With only lip service, those elected officials we voted into office to represent us and uphold the Constitution leaves me with great axiety. As omission of truth is a lie, omission of action is admission of corroboration. O has already shown ‘I am in charge” leaving all wondering what he will do next. He needs another 4 years to complete his ‘fundamental transformation” of the United States. The Field Manual for Internment and Detention was updated in 2010. All is ready for civil unrest, terrorist action or riots to call his minions to order as the US is already determined to be a combat zone. I hate to say it, but his calling a national emergency is not a surprise, but expected. A war started with Iran invites bombing on our soil. Take your pick. He need 4 more years and looks desperate to be re-elected. When you study history you will find many cases where election have been suspended or attempted to be suspended. All of the attempts have one thing in common, the Nation or Nations in question turned their backs on God. Pray that God will have His way with America and we as a Nation will turn back to God….